Afternoons have been exceptionally beautiful here on Camano Island, with sunshine filtering through the fall colors one minute and misty rains the next. A few days ago a warm breeze blew through, so I took a long walk and found myself contemplating Ms. Dillard's quote in relation to my own life. How do I want to spend my life? This is a tough question, because although for the past couple of years I have been learning to sail and provision a boat in preparation for long distance voyaging, right now, I am on land and my daily existence is anything but adventurous. I struggle to balance forward gazing and all its planning with the day to day tasks of land life. How to be here fully, but remain rootless? When I returned from my walk, I did a little bit of cleanup in the yard, mainly to recover some chard and herbs into which a lot of lemon balm and grass had encroached. As I cleared a little patch of dirt in the middle of a large piece of land, bordered with blackberry brambles, the wisteria from hell, and over run by all devouring local deer, I deeply sensed the futility of my effort. In respect to affecting anything in a lasting way, my work is of no consequence whatsoever. Yet I also know that I desire a life in which I grow at least some of my food. 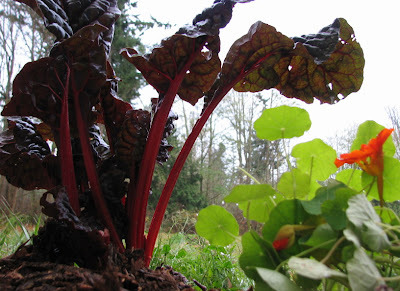 I love growing things, plus politically, ecologically and economically it makes good sense. I have been in a rather contemplative mood since election night, and everything seems to be more meaningful these days. So, I rescued the little chard plants and made room for some garlic! I also took on some bigger jobs that will be beneficial next spring. I took some old cardboard boxes discarded from Steve's "Kentucky Estate" liquidation, and laid them out in the back yard to create the foundation for an herb bed and path. 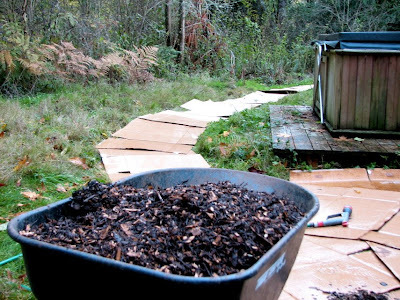 Then I began the marathon of hauling and spreading wood mulch. The idea is that next spring, I'll pile the mulch in heaps, plant herbs and lay down a stone (or ??) pathway. Sure the back yard is not the best gardening site (the front yard is a huge, ever sunny meadow!) but for some reason, I just had to do the back yard. As I labored, I recalled, as a child, hearing Grandma speak of Victory Gardens of WWII which I did not have any appreciation for at the time.Today such an endeavor is even more urgent, not only to help feed ourselves but also to reduce use of fuel and all that goes along with it, and most importantly, to bring us together in our communities. The US Department of Agriculture estimates that more than 20 million victory gardens were planted. Nearly 60% of the population was actively involved with growing food at some scale. Fruit and vegetables harvested in these home and community plots was estimated to be 9-10 million tons equaling all commercial production of fresh vegetables at the time. Can you imagine an effort of that scale today! Wow! Think of how ridiculous it is that you buy an apple from the store that has been dieseled around and stored for weeks, while the guy two driveways down is cleaning up rotting apples from his yard. How absurd and disconnected our lives have become! I believe the best antidote for absurdity is putting one's hands in the dirt. So, consider growing at least one thing in a window pot, or till up a little square (or spiral) for spring, or start organizing for a huge community garden project. Whatever you do will help both yourself, your community and the nation, even if only a little. Growing our own food is hugely ambitious, probably too ambitious for many of us, but growing something is possible. If you are already doing it, then my hat is off to you. You know who you are--Camano friends, Oly friends, Arkansas friends, Orcas friends, Oregon friends, Cali friends, NY friends, and unmet friends. And for the rest of you, just plant a bulb of garlic or get some basil going in a window. It will feel good. You'll be thankful you did it. This is my goal for the spring. We moved to SoCal last spring and I am trying to live a much more sustainable life. Oh wow! I have to come back and reread this one. The photos are beautiful, and did you plant some additional nasturtiums or did they rebound??? Just gorgeous. Your attentions and efforts are not futile; they shine in the beauty of these photos and your posts. Your eye and hands create works of wonder, dear Sky, and your thoughts inspire contemplation in me as well. The nasturtiums rebounded. Thank you for noticing!! !